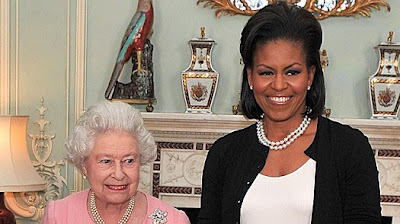 What's up with Michelle Obama's hair? Methinks an A380 is trying to make an emergency landing on her forehead. Eeek! I actually like this hair. She may need corrective eyelid surgery, though. I do have a problem with the outfit. If you took out the pearls and gave her a white apron, she would look like the cleaning lady. But hon, her hair makes her wide forehead even wider! Taob sya though ke Carla Bruni-Sarkozy.